TELLIER BRISE-SOLEIL, the specialist in shading systems and external cladding, provides its BIM catalogue for the prescribers. 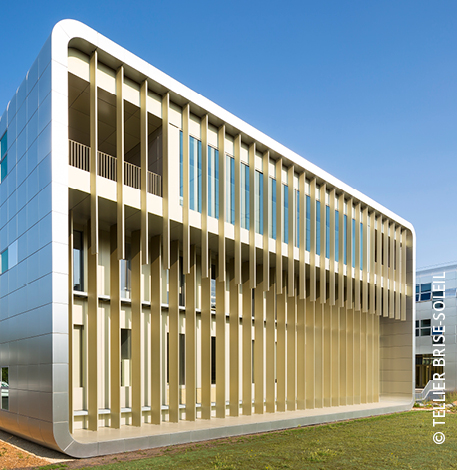 Combining thermal comfort and natural light, Tellier Brise-Soleil’s sun protection systems made of aluminium permit to optimize energy consumption and reduce blindness phenomena. It is an effective and aesthetic bioclimatic solution designed to protect buildings from high temperatures. Beyond their functional aspects, these sun protection systems contribute to a nice ambience. With a neat design, they fit aesthetically on all buildings regardless of the architectural style. With a wide range of profiles and finishings, the product range offers multiple design possibilities. The main objective of the manufacturer’s BIM approach is to offer total autonomy to the prescribers in the design and modeling of their architectural projects. The BIM catalogue of Tellier Brise-Soleil has been modeled by Polantis’ architects and engineers. Simple and intuitive, these parametric objects allow prescribers to create customized sun protection systems within just a few clicks, whatever the applications and dimensions desired. Beyond the 3D representation of the products, all technical information is accessible through a detailed sheet (Building references, Installation and maintenance …). Visit Polantis.com in order to find the entire range of Tellier Brise-Soleil’s BIM catalogue.